Hey, I love your patterns, but wanted to let you know the link to the triforce pillow is broken and just links to the Wampa pattern. It seems the bat plush link is broken. It keeps saying “page not found”. In addition to the trick I use in step 1 (where I hold the eye, then slide the paper pattern away), you could also fold the fabric in half after they’re fused to be sure they’ve lined up 🙂 Holding it up to a mirror to see if it looks right reversed is another good trick. But I mostly just do a quick measure from the edge of the eye to the edge of the fabric to be sure the numbers match up for both. The head might need some tweaking to form the elongated face, but hopefully that at least helps a bit! I really love all your plushies patterns ! Do you think the narwhal ou dino plushies are suitable for a 1 year old baby ? I don’t have first hand experience with it, but I think it should be okay 🙂 I know appliqueing the eyes is good since they can’t be pulled off, and the tiny horn, legs, and fins might be easy to grab onto. If you make cat bus and jiji it would just make my day. These are so amazing. I was looking online to see what stuff i could give to my friends and I came across your blog and it is amazing. I am so excited to try these out and give them to my friends. Especially since I want them to know that I am always there for them. So thank you so much for making these super cute plushie patterns they are super cute. I love your patterns and made a few of your box shiba inus for friends and family for Christmas. This has lead me to discover my great enjoyment of sewing and I’ve even begun to try to my own at making patterns (with minimal success but I will keep trying), but I was wondering if you allow your free patterns to be used to make plushes with the intent to sell? I’m so glad you’re enjoying the patterns 😀 That’s so great to hear! 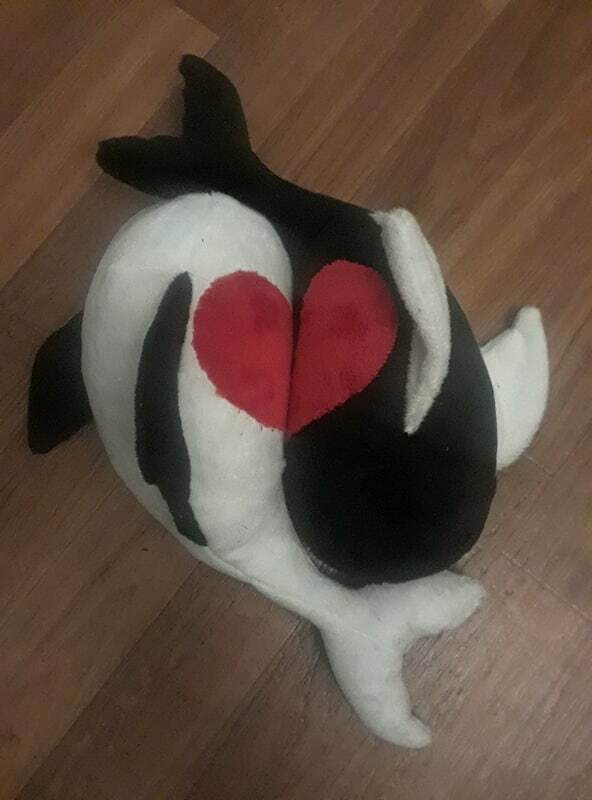 Recently finished the Koi Plush! I’m gonna be just handsewing the eye appliques on, since the hearts stayed put easy enough for me to hand sew them. But they’re super cute! Bigger than I expected, but that’s definitely a plus. Next to try is the Octopus I bought from you! You are my fav toy designer Choly! I love how you make them look sooooooooooo cute!!! Its truly an amazing and adorable plishie! The pdf I downloaded cut out part of the pattern, so I’m left with half the body and some other weird pieces. If you could tell me how to fix this that would be great! Thanks!!! Has the Wampa pattern been deleted? We LOVE you free designs. I am teaching to girls 7 & 9 how to sew. We found you page, and we just love it. Free Patterns – Plushies Your embroidery designs for them. Do you have them in smaller hoop size. My hoop is B hoop inside is 8 3/4 X 6 3/8 inch. I tried to resize but not sure how. We would love to have these is a JEF format to fit my hoop. Thank you so much for the kind words! I’m so glad the patterns have been working well for you! I really love your plush patterns what a taleted lady you are. My great nephew now has the bat and I have just finished a purple and green toothless for his Christmas present. I’m going to have a go at the dragon scarf next. Thank you so much. You’re very welcome! I’m so glad you’re enjoying the patterns! Hi there! How do you feel about people selling creations made from one of your patterns? I wouldn’t be selling the pattern itself, of course. You are more than welcome to sell items you’ve sewn from my patterns 🙂 A credit back to me would be most welcome, but not absolutely necessary. I absolutely love the Love dragon pattern! Easy to make such a small and cute dragon plushie! I’m also planning to do the bat so I can have a gift to give to my friend! Thank you so much for the patterns! Schön! Gute Anleitungen , Super!!! Gut, auch mal was kostenlos! Hey, I love love your patterns. They are so cute! I’ve made a couple for my family already and I was wondering if I could donate the animals I make from your patterns to a childrens hospital? Thanks! please make a jiji pattern. my daughters want me to make one but I cannot find one. your patterns are great. please help.